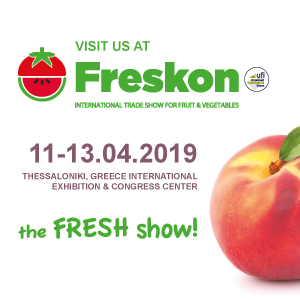 COME AND JOIN US……… FRESKON, is an International Trade Show for Fruits& Vegetables that will take place in Thesaloniki form 11 to 13 of April 2019. The fair is serving as a meeting place for producers, international retail groups, as well as domestic and international transporters of fresh fruits and vegetables. The fair will be the focal point of the fresh fruit and vegetable market of South-Eastern Europe and also for the overseas buyers. During the event exhibitors will meet representatives from major international supermarkets chains, commercial businesses, and distribution company-networks. Symphonia Ltd with its strong “One-Stop” consolidation service for Fresh Produce will be able to introduce this unique feature to all the hosted buyers and visitors that will like to visit our stand. We will be happy to meet you!